There aren’t any obvious parallels in the cases of FATA journalist Hayatullah’s murder and the Baluchistan authorities’ action against ARY TV. On the surface, both case s are poles apart. And not just because they relate to regions that are as far removed from the national gaze as the distances that separate them. Except, in both cases journalists revealed versions of stories related to the thorny issues of drones in FATA and insurgency in Baluchistan that contradicted the government’s. The mainstream media is often blamed – and not without a reason – for blinking on remote borderlands hit worst by militancy and insurgency, more so Baluchistan. But unsung are the local journalists who dare break a story – they are our windows on the restive border areas that journalists from outside have virtually no access to. Local journalists walk the fine line, caught in the crosshairs of conflicting interests that the state and anti-state elements seek to propagate or protect through brutal tactics aimed at information control. Hayatullah was among the first of casualties caused by drones, in a manner of speaking. He died taking the lid off of a tacit deal between the Musharraf’s military government and the Americans to use drones against al Qaeda and Taliban targets in FATA. His pictures of Hellfire missiles hitting Abu Hamza Rafia’s house in North Waziristan, published in Ausaf and the European Pressphoto Agency, gave the lie to Musharraf government’s claim that the al Qaeda militant died in a blast of explosives stored in the house. We don’t know if the security agencies killed Hayatulllah. However, from the military officials’ refusal to cooperate with the commission to “get statements recorded despite directives of ministry of defense”, and the “cruel misinformation campaign during his six-month disappearance” that the government engaged in, there is one conclusion we can safely arrive at: The state certainly didn’t do much to protect him or bring his killers to justice. Even after his death – followed by the death of his wife killed in a bomb attack probably because she knew too much – the PPP government kept the commission’s report under wraps for five years. Now consider the case of ARY in Baluchistan. ARY received a graphic video of the destruction of Ziarat Residency from the Baloch Liberation Army, one of the more vicious banned groups alongside Lasker-e – Jhangvi that can’t take no from journalists when it comes to their demand for media coverage of anti-state, sectarian activities. The cost of refusal, these groups have shown time and again, are high for the media and the journalistic community. ARY aired the BLA footage that contradicted the government version, not with words but visuals. Whether it was done out of journalistic responsibility or in the face of threat, it doesn’t matter because on both counts – for journalism or self- protection – the decision can be justified. Revealing lies and obfuscation that governments – military or democratic – engage in has consequences ala Snowden and Sergeant Manning. For ARY it came in the form of Supreme Court censure and police action. For Hayatullah, it was death delivered with a bullet to the head. 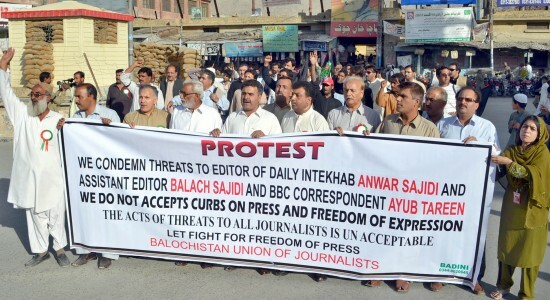 In Baluchistan, where authorities have failed to protect journalists from state agencies and the anti-state banned groups including insurgents and sectarian elements, the case against ARY points to a third front against media – a legal threat. The shadow of court and police action under the Anti-terrorism Act looms large over journalists and journalism in a province we see or hear little about in the mainstream media. Media representatives summoned to the high court said they received threats from proscribed organizations that they would be targeted if the media didn’t comply with demands to publish their statements. It was out of fear that they carried such stories. The court order however said that it could not be a justification for violation of law and constitution of Pakistan – Section II of the Anti-terrorism Act that says “the printing, publishing and disseminating any material that instigates hatred or gives projection to any proscribed organization” will face the consequences provided in the law. Journalists guilty of committing contempt of the high court order would be sent to prison for 6 months whereas a court case registered under Anti-Terrorism Act could lead to 3 years in prison. The local newspapers have continued carrying statements from the banned organizations saying “6 months in prison are better than death at the hands of militant organizations.” After the High Court order, journalists met several times, only to decide that if they followed the court order, they could not possibly work. On the occasion they said no to underground groups, the response was, “if we can attack the DIGFC house and the Police Chief, we can attack your office which is far less secure”. To comply with the court’s decision, the local journalists formed an editorial board to edit stories for “sensitive” content and a uniform message before distributing them to media outlets. As expected, it hasn’t worked as newspapers tend to follow their own policies. The court sources insisted that at a time when the media was concerned about safety, the court order ensured exactly. The see the order as a legal “protection” rather than hindrance – a reason that the journalists could offer to resist pressure and threats from militant organizations. However statements from judiciary that journalists “should close offices if they can’t stand up to threats” betrays ignorance and insensitivity towards media and the way it works. The ARY case was something waiting to happen. Since the Baluchistan High Court order in 2011, the Quetta police has charged journalists and registered cases against media that continue to publish statements from banned groups. On any given day in any newspaper, there are a number of these that the insecure, threatened local media working in a volatile, unsafe Baluchistan can’t say no. That said, there are concerns about practices within media that exposes it to threats and leads to restrictions on press freedom. While the media is quick to renounce moves threatening its independence, fact is, there is little soul searching or effort on part of media groups and owners to address the abysmal professional and ethical standards. Media professionals in the province recognize the fact that journalists – due to pressures, inducements or political loyalties – often side with militants, insurgents or the military. Certain journalists, especially those in the districts, identify with the cause and stance of combatants and fail to disassociate themselves from them professionally. A big threat to journalists stems from the fact that they become party to the conflict by siding or sympathizing with one group or another. However, when the chief justice is irked by the graphic display of the Ziarat Residency demolition at the hands of insurgents, and the police, getting their cue from the court’s disapproval, proceed to register a case against media, they are essentially displaying the same attitude as Hayatullah’s killers in a bid to control media. Only this time, they are not shooting the messenger but gunning for the medium. In doing that, they willfully ignore that the local media, the only source of information on the restive Baluchistan, is besieged by pressures from all sides – the insurgents, the military, the political parties, the religious sectarian groups, the tribes and the government. While protecting the society (and the obfuscation of truths the governments engage in), aren’t the courts – and the state – responsible for protecting the journalist, also a citizen, and the people’s right to information? Can the journalist, working under hazardous circumstances in Baluchistan, say no to BLA or LJ when they come, armed and dangerous, to their media offices, insisting on coverage of their activities? Federally Administered Tribal Areas (FATA) and Baluchistan.